Thank you for looking after my fish. I love the fact that you invited me for coffee. There are so many reasons to buy someone a cakey gift. But it can be tricky to think of a theme for some people, especially if they don’t really have a ‘thing’. Do you know anyone like this? Look no further than a little set of Really Yummy cupcakes. Choose a classic buttercream swirl, or take a look at some of our recent, more generic themes. Each set comes in a lovely presentation box, ready for gifting. These were made for a birthday, but the decoration was up to me. I love a pinwheel, and these could be made in so many different colours. These cupcakes were made for a Winchester family dentist, to say thank you. The brief was smiles. Just smiles. I loved it, and hand-painted as many smiles as I could. Gorgeous! These sunflower cupcakes are absolutely gorgeous, in any colour. And fit so many occasions. I’ve done orange sets, pink sets, deep red sets, and these multi-coloured ones looked fabulous together. Reeses peanut butter cupcakes. Peanut buttercream, and a Reeses topper. One of my favourites. And so delicious they couldn’t get enough. The customer came back for the same order a week later! And handbags this time. This lovely customer always leaves colour schemes up to me, and I happened to be working with these colours on another cake. I thought they looked so funky, I ended up using them for these too! Classic car cupcakes. A popular choice, especially for those hard-to-buy-for men. I’ve done a couple of these sets, and tweaked them slightly each time. For this set I picked some great retro versions of the brand logos. So there you have it, cupcakes. Did you see anything you like? Has it given you any ideas? Join the discussion in the comments below. Is one of these cupcake sets yours? Did it fit the bill? Head here to leave a review and I’d be so grateful! *I don’t think Yellow Day is actually a thing. But maybe it could be…. Because I’ve never been asked to. But I would absolutely love to make a tap-dancing dinosaur cake. If tap-dancing dinosaurs were your thing. 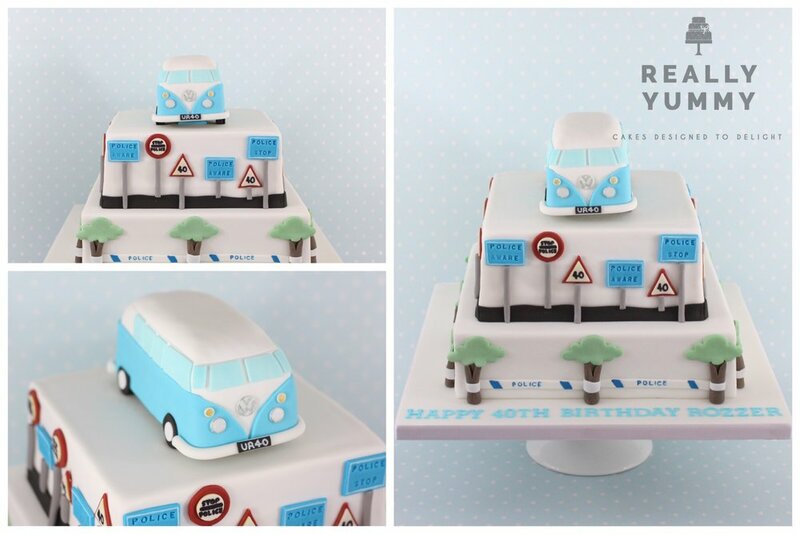 A question I sometimes get asked by new customers, is ‘have you made a cake with this theme before?’ I understand why it might seem like it would be useful to see something similar, but the truth is I have only re-made a tiny number of my cakes. The vast majority are made for the first time. And I love the fact that I can make your cakes so wonderfully personal. The random combination of hobbies that come together on a cake. Or the off-the-wall theme that works so well. Read on to see a few of my favourites. At first glance, this is a gardener’s cake. But look closer, and it’s a cake for a gardener who used to work for the Electricity Board in the 1980s. And always worked on his motorbike in the back garden. Creating a great colour scheme, and some fabulous detail on the top. This cake was designed to be a talking point at the birthday party, detailing various places and interests that meant something to the customer. They included the New Yorker hotel, Mr Boni’s ice cream shop in Edinburgh, and a love of flowers and books. I loved turning them into shop fronts, and putting the iconic hotel in the clouds. This cake was for someone who loves teddy bears, cats and Cliff Richard. At first it seemed like a tall order to combine them, but popping the bear into a cat-decorated gift box, and hand-painting Cliff onto a picture, seemed to hang them together. I love this one. These cupcakes were for a girl who loved dogs, cats, shopping, and the program Pretty Little Liars. Again, not the most natural of combined themes, but in this case sticking to a single colour palette across them all, made a wonderful set of cupcakes. 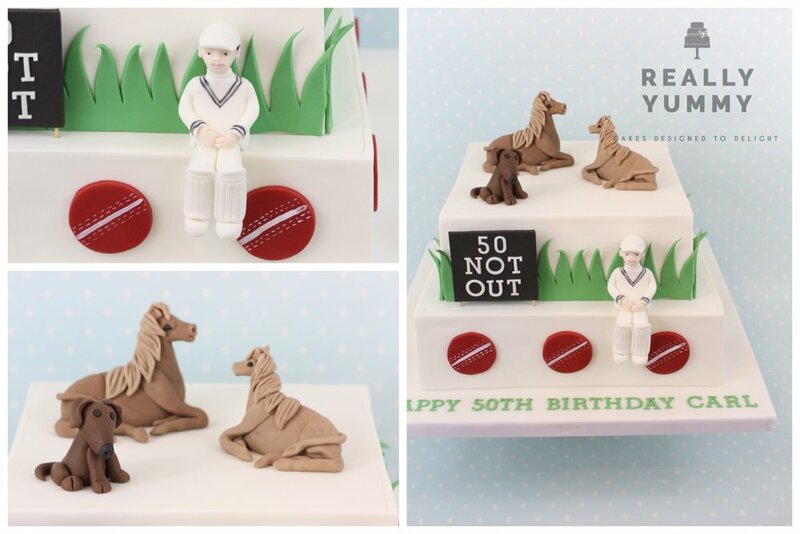 The themes of dogs, horses and cricket aren’t too different, but it was lovely to represent the recipient’s own animals alongside his hobby. The brief for this cake was to include the birthday girl sunbathing with a glass of something fizzy. Now I would normally create a beach cake around this, with sand and blue sea. However, the customer wanted her in her black and white swimsuit, and include a bit of bling. And the result is a completely different cake. I love this kind of personal detail. So there you have it. A collection of some of my gorgeously personal cakes. 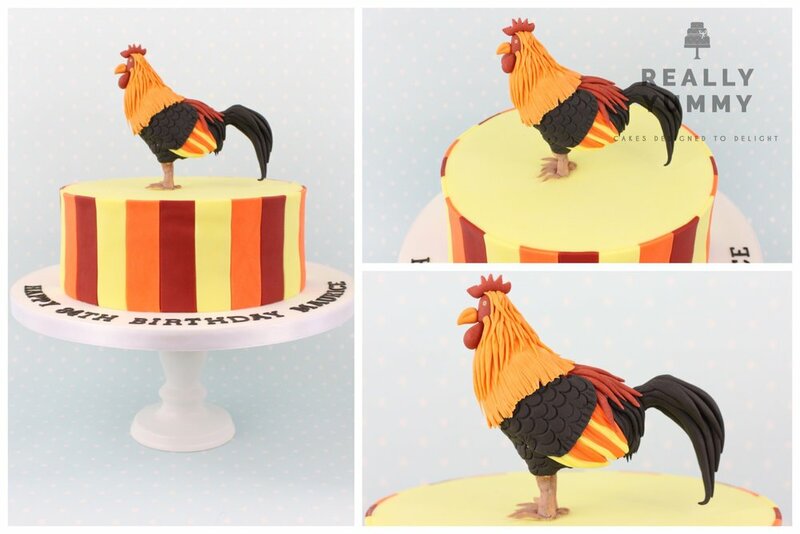 I absolutely love the challenge that these sort of cakes bring. I’ve often thought that there must be as many reasons for buying a Really Yummy cake, as there are Really Yummy customers. But it was definitely fun to explore some of them. 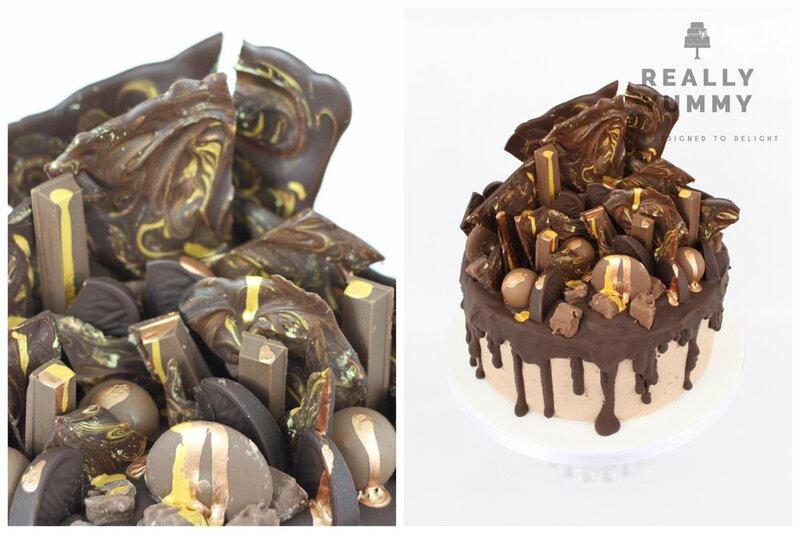 Madagascan vanilla, double decadent chocolate, rich fruit cake, delicious lemon cake. The list goes on. Really Yummy cakes are home-baked, and simply moist, flavoursome and delicious. No doubt. Aren’t some people just so hard to buy for? My poor brother-in-law happened to quite like coffee, and it was then the *only* thing I could ever think of, to give him as a gift. Those men are especially tricky, but imagine turning up with a gorgeous cake, decorated with their favourite hobby, or TV show, or sports team. That’s the present totally sorted. Or themes. Pretty much anything you can think of, can be put on a cake. Or around a cake. Kids cakes, retirement cakes, thank you cakes, anniversary cakes. You name it, I can make it. Even a cockerel. 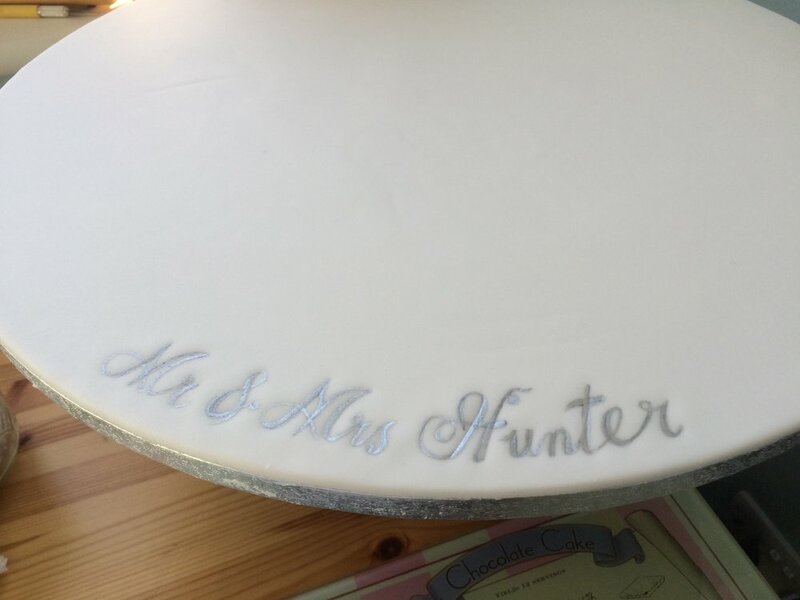 Whether it’s for a tea party for 6, or a banquet for 70, a bespoke cake can be made to serve the perfect number of people. This one was a little 6″ cake, made to serve around 10 people. Baking a cake is messy. Decorating a cake takes time. Yes, it would be lovely to do it yourself, but why don’t you keep your sanity and order a Really Yummy cake instead? 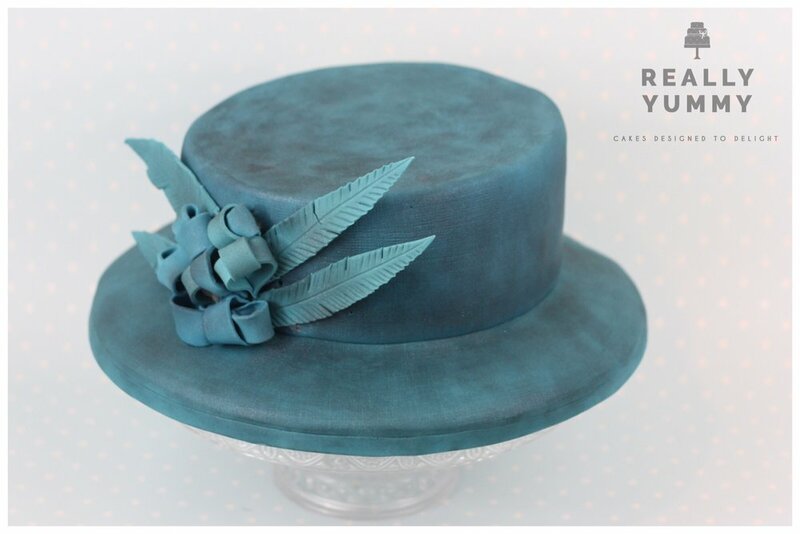 A Really Yummy cake is about 3″ high, and firm and moist, which makes it a dream to cut. All even slices, not collapsing sponge, and the last slice as good as the first. As it hasn’t come off a production line, nobody will have seen your cake except me. It’ll be a super surprise for you, and for your loved one. 8. The tick on your list. I live my life by lists. And lists of lists. Especially when one of my children has a birthday. Delegating the cake is such an easy thing to do, and such a relief. Your cake will have been baked a couple of days before you eat it. No preservatives, or sitting on a shelf for a month. Just like you baked it yourself. Something as simple as including the recipient’s name and age (even if it’s not a ‘zero’ birthday) can make all the difference. Such a lovely personal touch. So there you have it. Just a few reasons to arrange a bespoke cake for your special occasion. And a revisit of some Really Yummy cakes. I’m not very good at ‘last minute’…. Anyone who knows me personally will know how I can’t be late, I have contingency on my contingency time, and the idea of doing something ‘last minute’ terrifies me! But a little while ago I made a ‘last minute’ cake. And I really enjoyed it. I normally need at least two week’s notice, but this lovely, but slightly panicked customer came to me on a Wednesday, and needed the cake for Saturday. No time to design, or mull it over even. I had to hit the ground running, in a week with two other cakes. So I was honest, and gave three cake options, all of which I had done before, and could be in the customer’s chosen colours. I then realised that it was actually fairly easy to fit in. No uncertainty with using new techniques, templates, or shapes and sizes. The stuff I normally enjoy, could be put to one side this time, and I would enjoy making the little tweaks instead. So, if you are happy with a few options, and you’ve left it a little ‘last minute’, please get in touch here and we can discuss your ideas.